The Mitchell Site was published by Eichenberger (1944:59-62) in the Missouri Archaeologist. It is also discussed in The Petroglyphs and Pictographs of Missouri by Diaz-Granados and Duncan (2000: 29, 55, 59, 116, 117, 233). The Mitchell site was placed on the National Register of Historic Places during 1969; it is not open to the public. 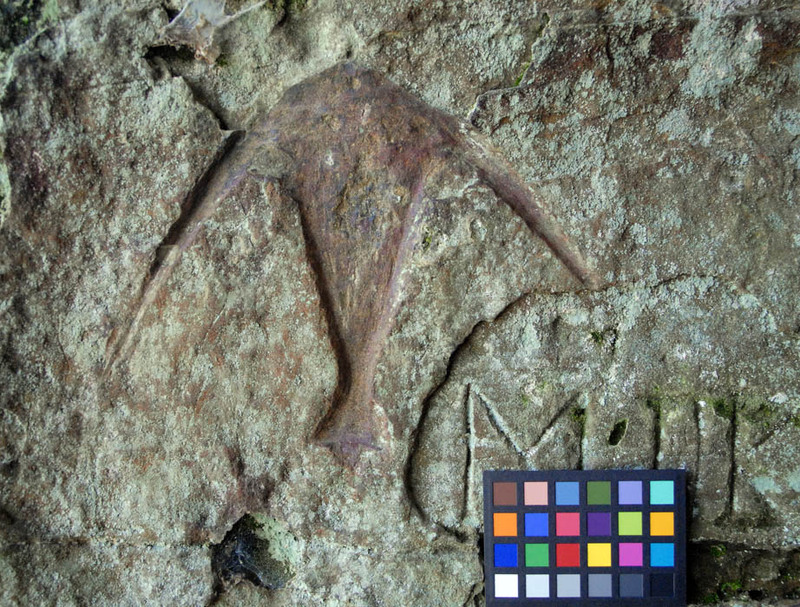 Incised petroglyph in the form of a full-tailed thunderbird. 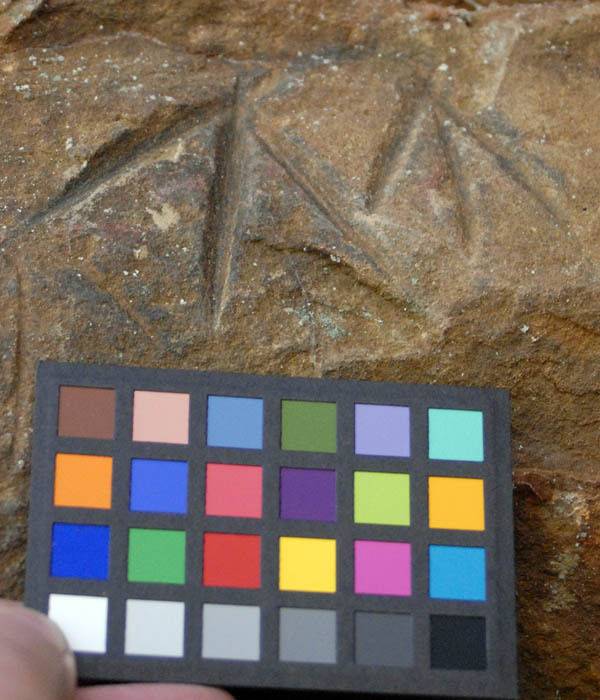 The interior of the design shows traces of both red and black pigment. 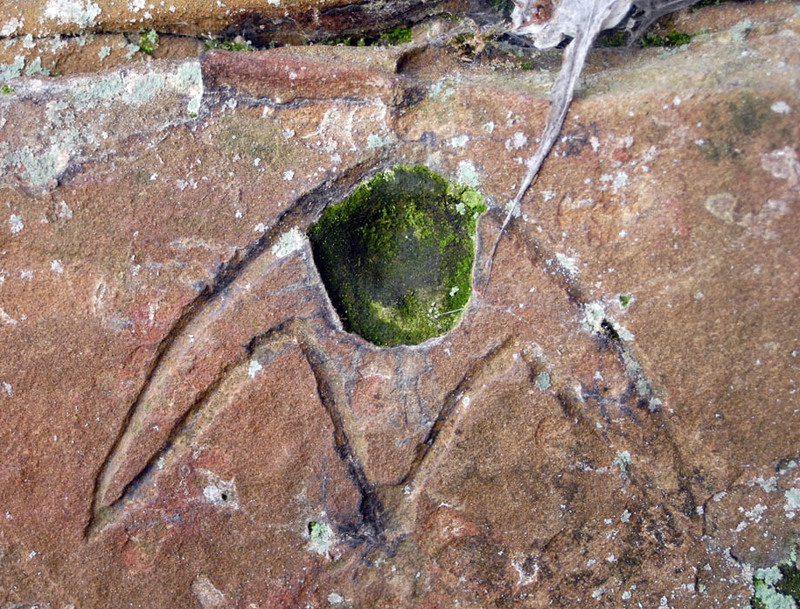 The petroglyph measures 15 cm. in height and 17.5 cm. in width. 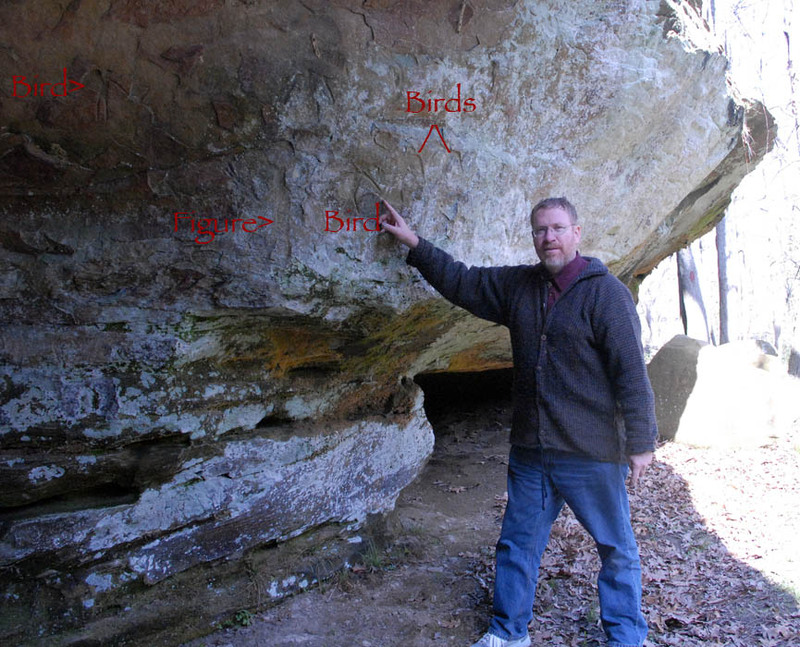 Rock art on the right side of the rockshelter includes a large human-like figure and several thunderbirds. The large figure and significant cluster of thunderbirds makes this the most prominent feature at the site. The panel of petroglyphs to the left side of the rockshelter entrance would be the second to catch an observer's attention. 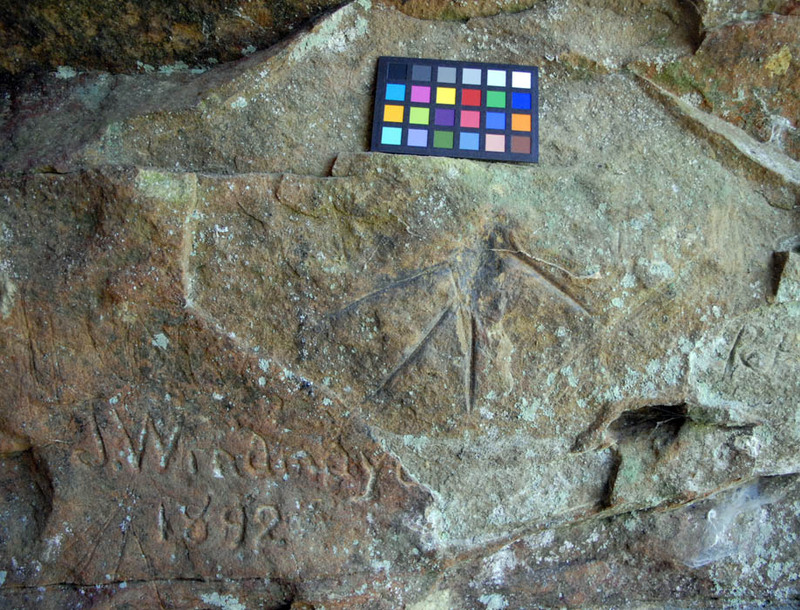 A third panel of petroglyphs are found at the back of the rockshelter on a waist high tipped slab of bedrock. Rock art on the left side of the rockshelter includes several thunderbird petroglyphs that were filled with paint, a pair of bird (turkey?) tracks, and a stylized glyph that might be interpreted as a house or lodge. 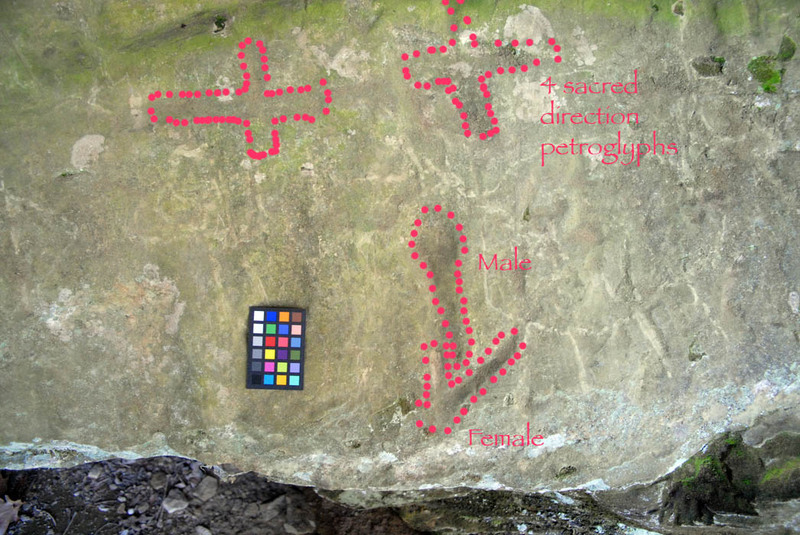 Petroglyphs at the back of the rockshelter includes male and female sexual motifs. The back panel also includes two equilateral cross designs that symbolized the four sacred directions of the universe (Stover 2005:1086). These petroglyphs do not contain pigment and they are more weathered than the panels on both sides of the entrance. It is possible that the petroglyhphs in the back of the rockshelter predate the entrance panels. Another explanation is that ritual offerings placed onto the surface of this panel caused the erosion of the petrolgyphs. The left cross measures 19 cm wall and 21 cm wide. The right cross measures 14 cm tall and 15 cm wide. The male symbol measures 22 cm long. The female symbol can be estimated as 24 cm wide. 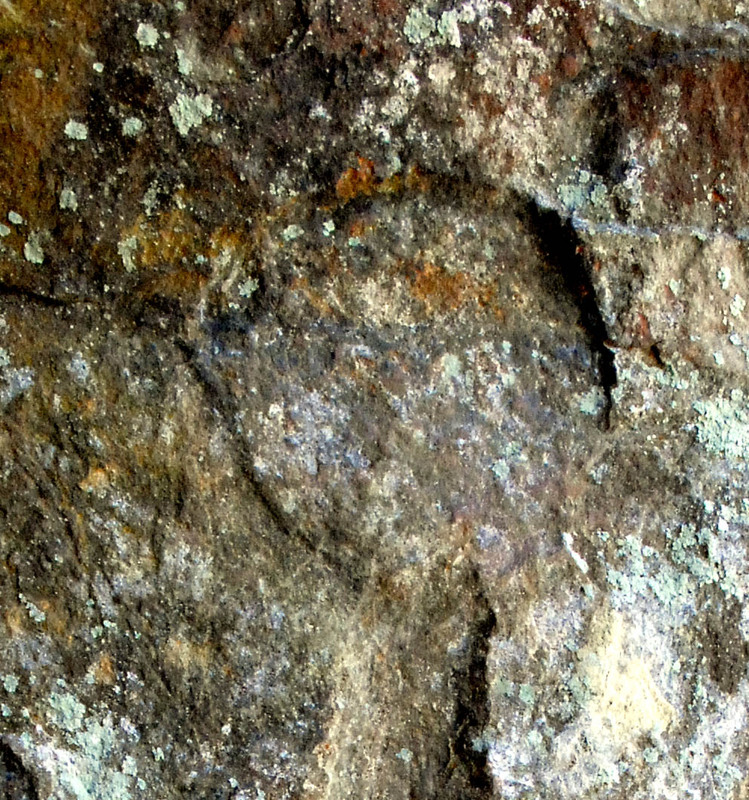 Figure of a human (shaman) or human-like spirit on the right side of the rockshelter entrance. The figure measures 45 cm tall and 35 cm wide. The head of the figure is 11 cm wide and 10 cm high. Very faint traces of black paint can be observed on the face of the figure. The circular nature of the face would appear as a mask on a shaman's face. Another possibility is that the figure is the embodiment of the Sun's spirit or Moon's spirit. Thunderbird petroglyph and nearby 19th century graffiti just to the left of the human-like figure. The bird measures 10 cm. high and 14 cm. wide at wing. Two lichen covered thunderbirds inside the rockshelter. Two thunderbirds on the left side of the rockshelter. Very faint traces of black paint can be observed in the outline of a thunderbird. Measures 13 cm tall and 15 cm wide at the wing tips. 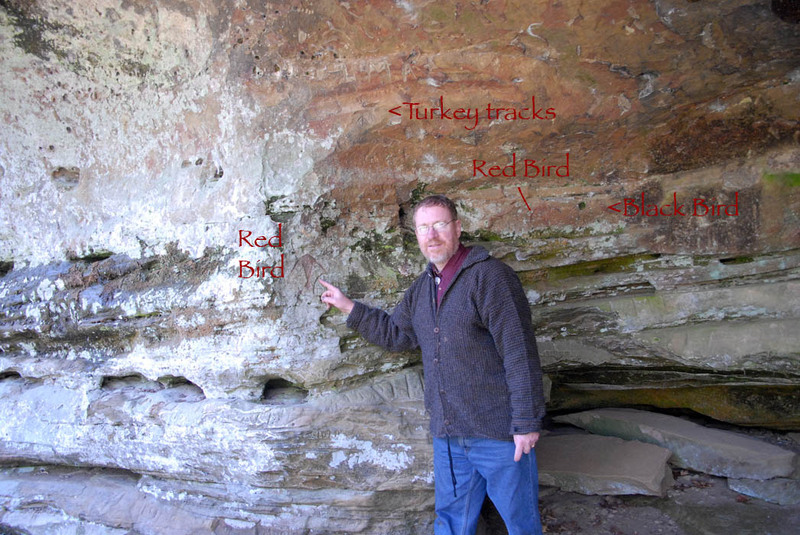 It is situated on the left side of the rockshelter and just to the right a thunder bird that is colored red. Thunderbird petroglyph situated on left side of the rockshelter entrance. 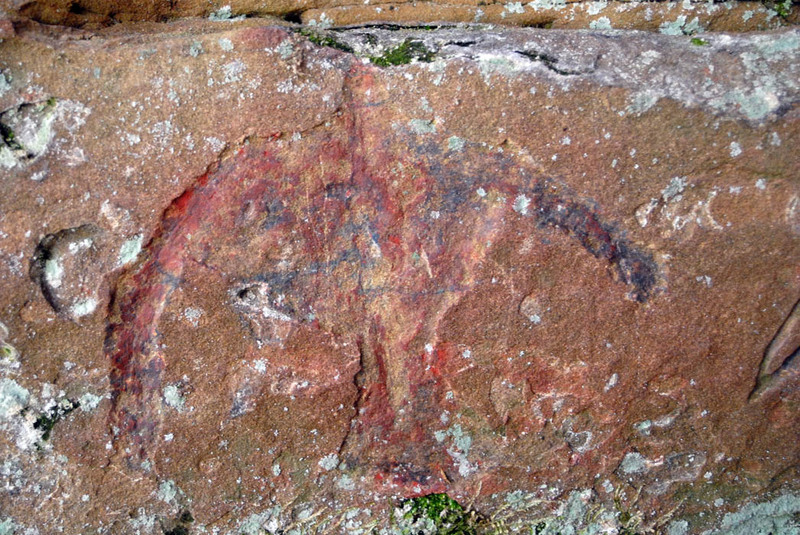 Traces of red and black pigment fill the interior of the petroglyph. The thunderbird measures 18 cm tall and 20 cm. wide. 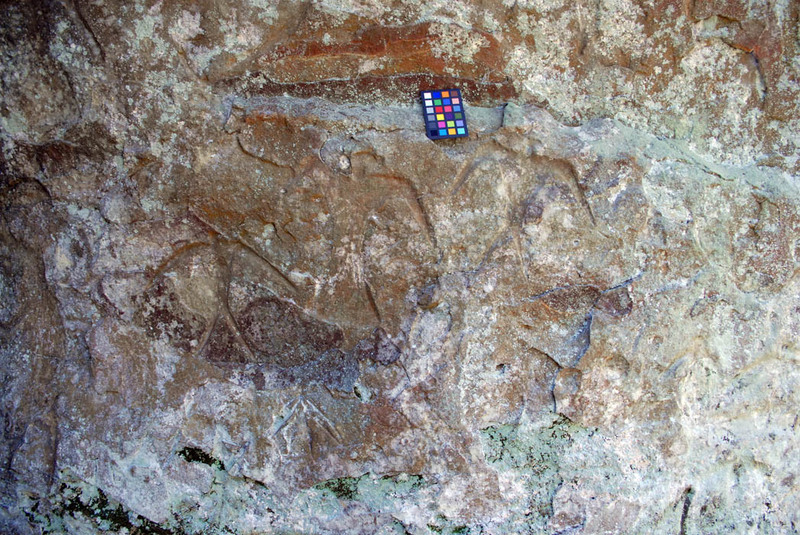 Two petroglyphs situated on left side of the rockshelter entrance. Very faint traces of black paint can be observed inside the outline of the thunderbird and in the area below its wing. 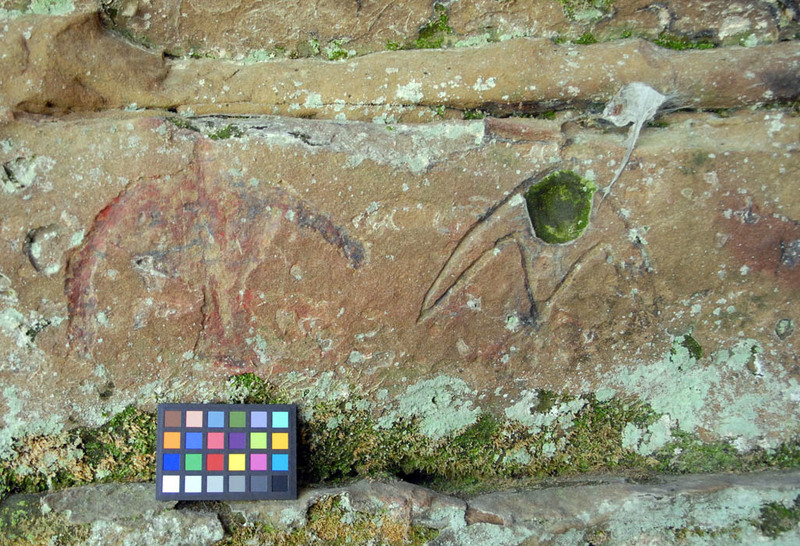 This petroglyph is situated on left side of the rockshelter entrance and is next to the petroglyph of a house or lodge. The thunderbird measures 14 cm tall and 19 cm wide at the wing tips. 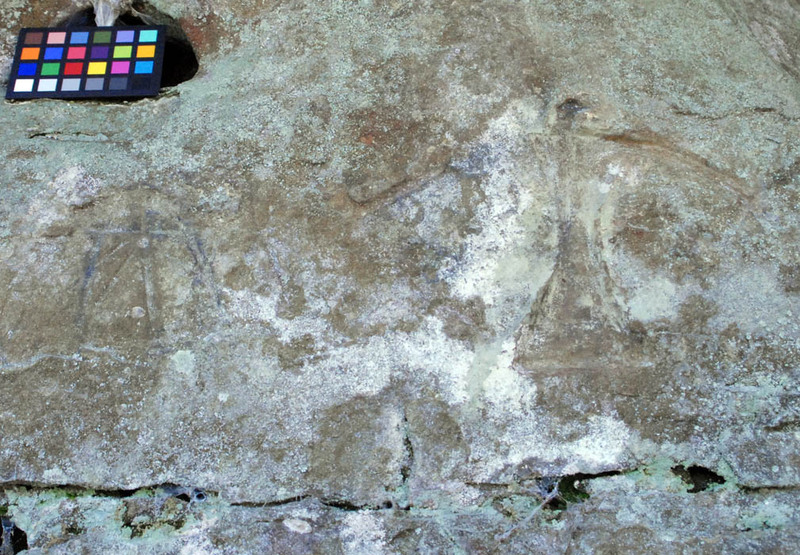 Very faint traces of black paint can be observed in the outline of two petroglyphs. These could be turkey tracks, symbolic tipis, or even upside-down female symbols. 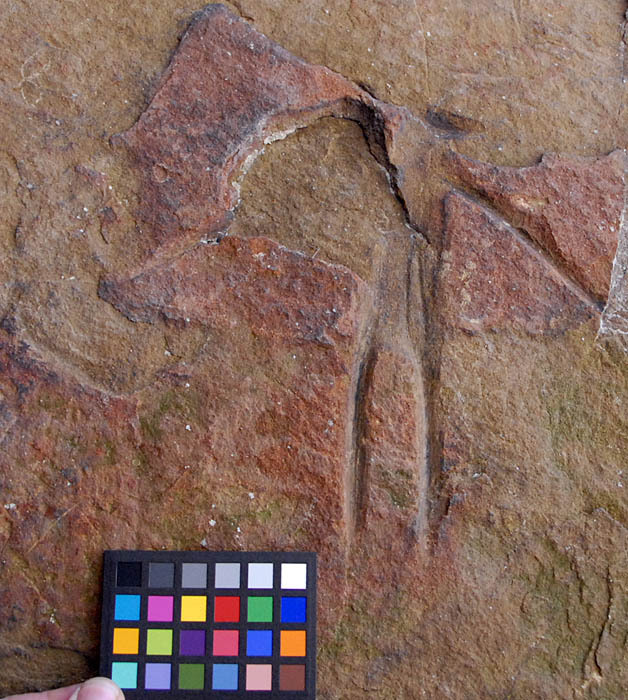 The left petroglyph measures 7 cm wide and 6 cm tall. 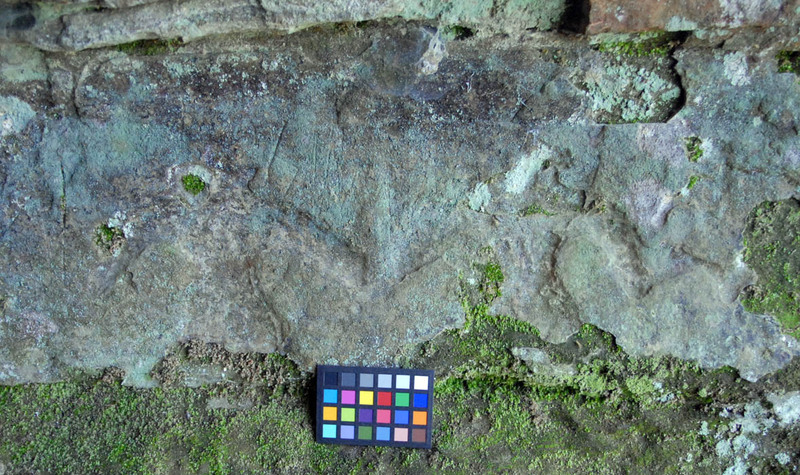 The right petroglyph measures 4 cm wide and 5 cm tall. Three petroglyphs of thunderbirds situated just to the right of the human-like figure. The left thunderbird measures 19 cm tall and 25 cm wide. The central thunderbird measures 24 cm tall and 21 cm wide. The right thunder bird measures 21 cm tall and 20 cm wide. A small thunderbird is situated beneath the central thunderbird; it measures 12 cm tall and 11 cm wide. 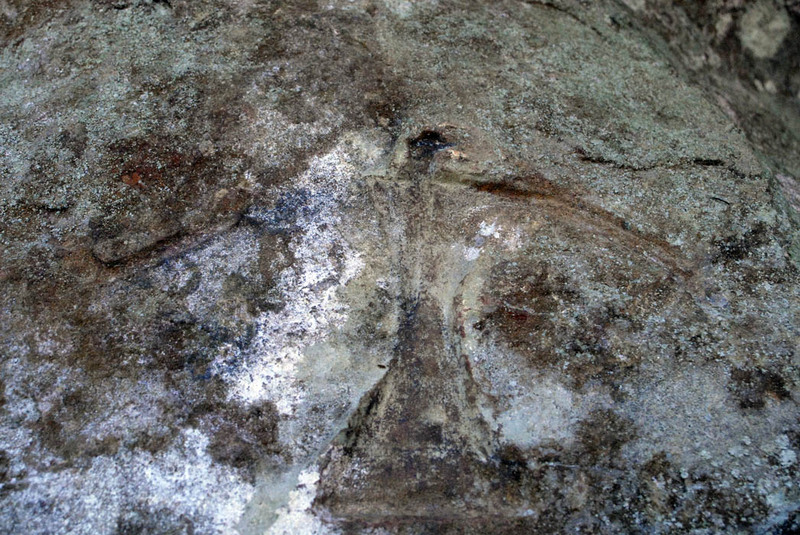 Damaged petroglyph of a thunderbird painted above the human-like figure. The thunderbird measures 20 cm tall and 19 cm. wide. General view of the approximately 80 meter long sandstone outcrop. 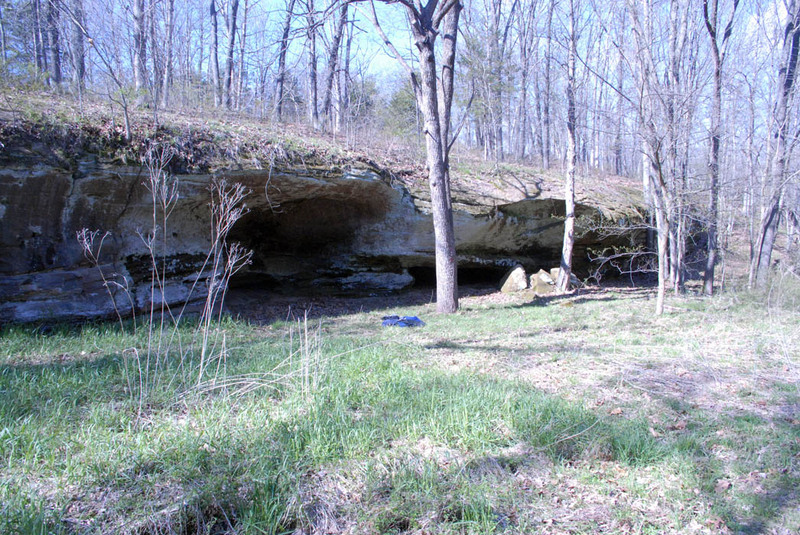 The rock is found on either side of the rockshelter entrance (center of photograph). A partial plan of the right hand panel at the Mitchell site (Eichenberger 1944:Figure 13). The Marion-Ralls chapter of the Missouri Archaeological Society removed 20 inches of sterile soil deposit inside the rockshelter in "Block One" and discovered two grit-tempered pottery sherds (one cordmarked and one undecorated) resting directly upon bedrock (Eichenberger 1944:61). Excavation unit designed "Block two" recovered more grit tempered pottery sherds including 4 cordmarked sherds and 5 sherds with damaged surfaces. This would suggest a date approximately AD 200 to 600 for the occupation in the rockshelter. Special thanks to Garry Saunders (MAS trustee) and Richard Marks (Boy Scouts of America) for their assistance in researching this site. 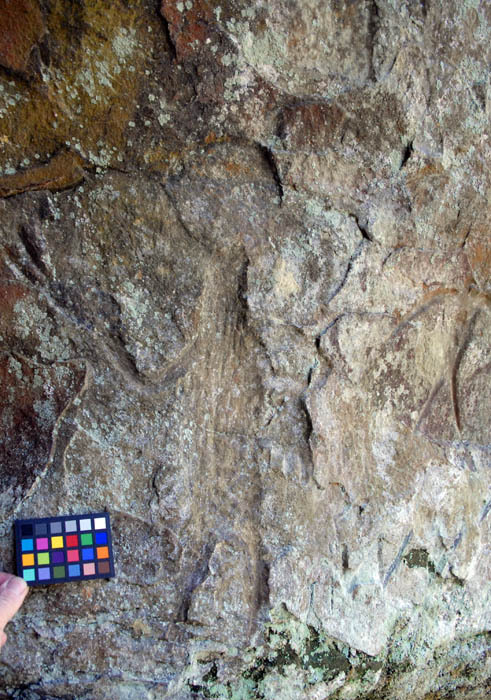 Warm thanks to Neathery Batsell Fuller for her insights into the interpretation of the rock art and forgiving my delayed return from exploring the site. 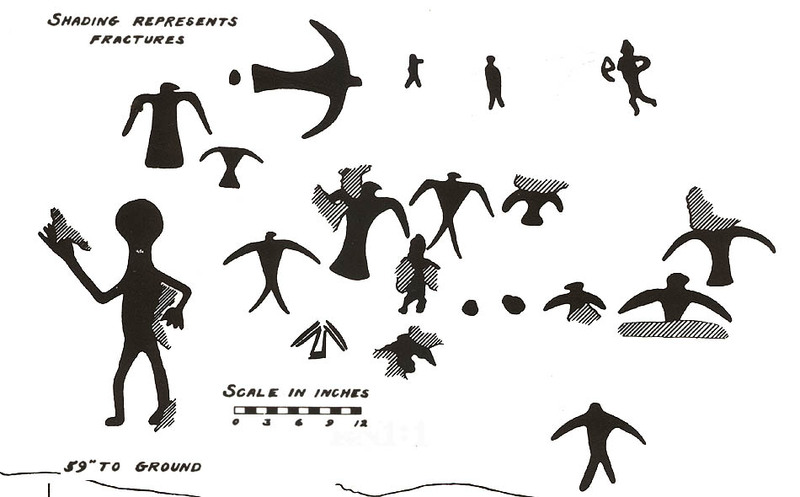 2000 Petroglyphs and Pictographs of Missouri. Alabama University Press, Tuscaloosa. 1944 Investigations of the Marion-Ralls Archaeological Society in Northeast Missouri. Missouri Archaeologist 19. GoodTracks, Jimm G. 1992 Iowa - Otoe - Missouria Language. Program for the Study of Indigenous Lanuages - University of Colorado. 2005 "Symbolism in American Indian Ritual and Ceremony" American Indian Religious Traditions: An Encyclopedia. Volume 3. Edited by Suzanne J. Crawford and Dennis F. Kelley. ABC-CLIO Publishers, Santa Barbara.